CAIRO (AFP) – Dozens of Egyptians protested on Thursday to demand the introduction of civil marriages, in order to be able to divorce or remarry. Protesters – Coptic Christians as well as Muslims – want the next parliament elected in September to adopt a law to allow civil marriages. 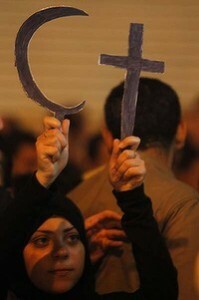 Currently, Egyptians follow the law of their religion when it comes to marriage and divorce. The Coptic Church only allows divorce in very exceptional circumstances, forcing some to resort to convert to Islam to obtain a legal separation. Muslim women are not allowed to marry Christian men, unless they convert to Islam. Today civil marriages are limited to Egyptians marrying foreigners. Cases of conversion have sparked tensions, and even clashes between both communities. “It usually starts with a personal problem and then transforms into a major problem,” said Karima Kamal, author of the book “The Coptic Divorce”. On May 7 clashes erupted in the working-class neighbourhood of Imbaba, an overcrowded maze of residential buildings and shops, that left 12 dead and 52 injured. Muslims had attacked the Coptic Saint Mena Church in Imbaba in a bid to free a Christian woman they alleged was being held against her will because she wanted to convert to Islam. But a week later, the young woman at the centre of the clashes, Abeer Talaat Fakhry, was arrested and charged with polyandry. She was living with her Christian husband in the southern city of Assiut when she ran away from home, converted to Islam and “married” a Muslim.